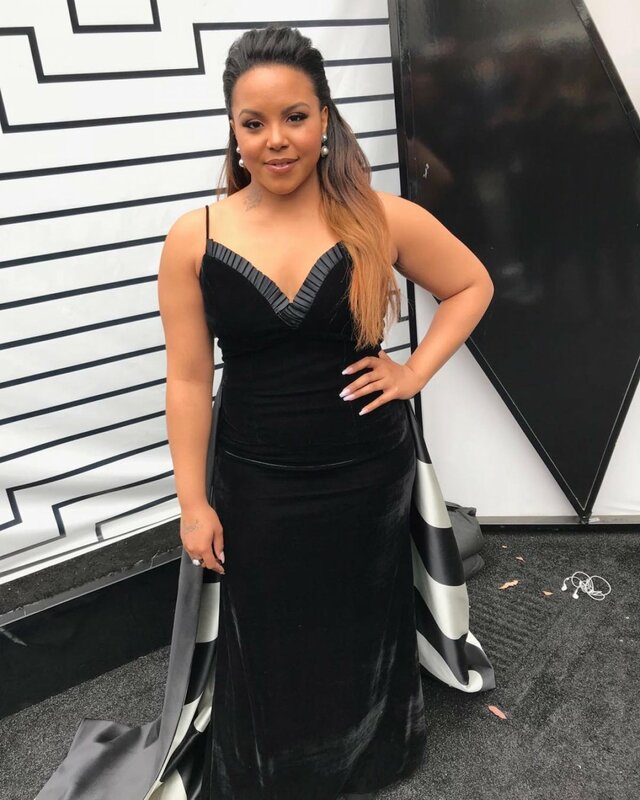 Sharane Calister was eliminated from The Voice when the fourteenth season's Top 10 artists were determined on Tuesday night's live results broadcast on NBC. Sharane, a 24-year-old from Des Moines, IA, was ousted from the The Voice instead of Christiana Danielle, a 22-year-old from Fort Wayne, IN, who was the other artist in the bottom two based on home viewer votes cast following Monday night's Top 11 performance show. Sharane represented coach Adam Levine's team on The Voice, while Christiana will remain on coach Alicia Keys' team going forward. After both artists sang a survival song on the results show, America tweeted via the show's "Instant Save" format to keep Christiana in the competition. Sharane's survival song was "If I Were a Boy" by Beyonce. On Wednesday, Sharane talked to reporters during a conference call about her final week on The Voice this spring. Below is a portion of what she had to say. What do you have planned next? Where do you think your career will head? Will you release some new music? Sharane Calister: Well, I definitely know for sure that my music career is not going to stop; this is only the beginning for me. I definitely want to focus on me and my album. I definitely want to create an album and possibly a tour. And I'm actually going to be the Keynote speaker for an upcoming conference for the Purple Project, where I'll be speaking to and working with foster kids. So that's pretty cool. And I plan on reaching out and working with other organizations related to adoption and foster care. So I'll be doing that and working on my music. What do you have planned in terms of an album, what type of style? Sharane Calister: Yes. I think I want to go towards more R&B and pop because that's what I did in the show, you know, I did R&B first, then I threw in a little pop with Shawn Mendes, and America seemed to like it. So I'm going to mix those two in there and make an album that way. Can you talk a little bit about what you think you've gained from The Voice experience and how you think it will affect your music moving forward? Sharane Calister: Yes. Oh man, I've gained so much. Just like personality-wise, like I'm definitely a shy person. So when I'm onstage, I definitely blossom into this other person, you know, and being on The Voice helped me find my artistry in myself. And working with two amazing coaches is an accomplishment right there because not everybody gets to say they get to work with two coaches. So it helped me, and Adam and Alicia both said some very, very kind words and shared wisdom with me to help me with my craft so that's definitely going to help me in the future. Adam really helped me step out of my genre. I've always thought I would just do R&B but, he pushed me to do it a little bit outside of my box, you know, the one thing he said, be different, you know, don't be like everybody else. So that's definitely going to help me in my music career now. You should be like Sharane, do what Sharane wants to do because that's why America got me to where I am now in the Top 11. So yes, everything I've learned from The Voice is going to help me in the near future as I continue to develop my artistry. Before the show, you were involved with a band. I think you even created and called it The Feel Right. Will you be going back to that group and performing with them again? And also was it the Purple Project that you were talking about and could you tell us a little bit more about that? Sharane Calister: So yes, when I get back into Iowa, I definitely plan to reunite with my band. I already have some gigs lined up, you know, that's I put on hold. So I'm definitely going to get with my band and work on some new music and get out there and book gigs, possibly gigs out of the state, you know, because we've only been working in Iowa. So hopefully this will get us to branch out and go into different states. And then with The Purple Project, The Purple Project is an organization for foster youth. They want me to be their keynote speaker at their 2018 Foster Care Youth Conference and just basically be there to represent all these kids and tell my story and then let them know to be strong, you know, and if they ever need somebody that I'm here for them. It's a great opportunity to speak to kids who went through the exact same thing that I went through. And the fact that I get to actually go up there and talk to them and let them know, you're not alone, is really amazing. So it's a great, great, great organization. It's called The Purple Project. And is that something that came up since The Voice or was that something you were involved in before? Sharane Calister: It was something that came up since I've been on The Voice when they heard my story. I was curious because you have been coached by two different coaches on The Voice can you tell us what the differences or the similarities between the two and the advantages or disadvantages? Sharane Calister: Well, I'd say they're both similar because they're just so honest, you know, and they're both so caring. I really wouldn't say that one is better than the other because they both have their own special ways of teaching. Like, I had my special moment with Alicia, and she's also one of my favorite artists. So it was amazing working with her and she's got this sweet personality like when she walks in the room it's like she would just melt your heart and warm your heart. And she gives the best advice, and one of the best things that she told me was, "Be Sharane, don't be scared, don't be pretty, you know, don't worry about the cameras. You go up there and you do you." And then with Adam. Oh man, Adam was just so relaxing and calm, like, the first time I met him he was in sweatpants. So that's probably the thing I'd say the only difference is that Alicia comes in with like a whole thing, an outfit on and Adam will just come in with sweatpants and just be chill and calm. And he's like a big brother. He treats you like he's an equal to you, you know, and it's just awesome working with both of them. I appreciate every moment that I got to spend with them. How did you feel during The Live Playoffs when you were the first one to be voted through? Sharane Calister: Oh my God, that was like the best feeling ever because I couldn't believe it, like, I couldn't register it in my mind that America saved me first. You know, it was just, a dream come true. I literally put my sweat, tears, heart and soul into everything that led to that moment to be on that stage. So the fact that America could see it and believe in me and actually vote me through to the next round. It was the most amazing feeling in the world and I honestly wouldn't trade it or regret it for anything in the world. To read what Sharane had to say to Reality TV World during this conference call, click here.